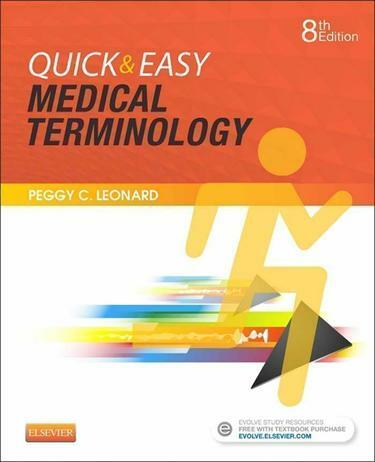 Brief explanations and a focus on basic word-building skills make this text perfect for shorter, one- or two-credit medical terminology courses or self-study.Moderate anatomy and physiology coverage offers just the right amount of anatomical information to support the terminology presented.Programmed learning improves your comprehension by offering immediate feedback. Review exercises integrated throughout lesson material enable you to test your knowledge and retention of material more frequently for quick reinforcement. Medical reports with review exercises allow you to study terminology in documents similar to those seen in the clinical setting — and practice using terms in real-life situations.Quick Tips located throughout the text provide fun facts and memory aids. Student Evolve resources include games; activities; flash cards; animations, pharmacology, CAM, and genetics appendices; audio terms, and mobile quizzes and flash cards that offer additional opportunities to quickly gauge strong and weak areas in a fun, interactive environment.NEW! 14 additional case studies with exercises let you practice medical terminology in context.NEW! Elsevier’s Adaptive Learning (EAL) updated to accompany the text and provide an engaging, interactive learning experience that transforms textbook information into lasting knowledge.NEW and UPDATED! Terms, definitions, and procedures keep you up-to-date with healthcare advances.NEW! Photos and drawings illustrate difficult terms and procedures more clearly and consistently throughout the text.